Michael Sana, chairman of Waipahu High School’s science department, has received Hawai‘i’s 2015-16 Milken Educator Award for his leadership in inspiring students.”Mr. 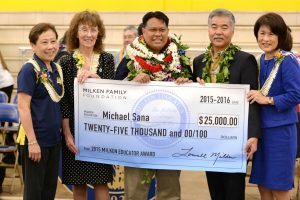 Sana’s work at Waipahu High has been truly exceptional and raised expectations of what is possible in high school science programs,” said Governor Ige. Sana is the only educator in the state certified by Rutgers University to teach biotechnology. Sana’s students have published their research 120 times with the National Institutes of Health and have worked at prestigious labs such as the Lawrence Livermore National Laboratory. “He sees the potential in you even if you don’t believe in it, and he pushes you toward that potential,” said one student.